Last night I met some friends outside Grand Central Station in Mid Manhattan. We soon realised that the main road of 42nd St which runs outside the station had been closed off to traffic. President Obama's been in New York this week attending the United Nations General Assembly meeting. There were a number of police officers on the street, making sure members of the public didn't break through the barriers onto the road. Nobody really knew what was going on, but something big was happening. Seeing how Obama was in town it was easy to put two and two together. Eventually we could see police sirens in the distance, a group of motor cycles passed, closely followed by a couple of Limousines. I'm assuming Obama was in one of the limos, although they passed so quickly you couldn't tell who was inside. After the limos passed there was more police and a couple a black vans that looked like secret service vehicles. It was all very exciting to think that I was only a few yards away from the leader of the free world! It's unlikely I'll ever be that close to the President of the United States ever again! I've already settled into a little routine here in New York. I leave my hotel - find a cafe off Broadway, I have black coffee, some bagels, and I read a copy of the New York Post. I'm like a proper New Yorker. The Post is a local New York tabloid paper owned by the media mogul everyone loves to hate, Rupert Murdoch. If you asked me to describe it, I'd say think of the Sun and a bit of the Daily Mail. Yes a nightmare thought for some of you out there! Generally I find American newspapers pretty dry to be honest. They're just not as entertaining or as interesting as British papers. I did however like the Post, despite not agreeing with its political views. It's ridiculously right wing and very anti Obama. Everyday this week there's been an attack on Obama's plans to raise taxes for America's highest earners. I already thought George Bush had lowered taxes for America's rich, but according to the Post Obama's plans are flawed. New York Yankee pitcher, Mariano Rivera set a new record for the most career saves? Don't ask me what this means, I really don't get baseball. Anyway this was massive news, and the Post even had a souvenir poster of the event. When it comes to bat and ball games give me cricket any day. Simon Cowell's X Factor arrived in America with a two hour special last night. A New York housewife Barbara Sheehan is on trial for murdering her ex cop husband. She shot him using 11 bullets, following years of alleged abuse. And a couple from Manhattan, kidnapped their 8 children from a Foster home in Queens New York. They still haven't been found. As I'm only here in New York for four days, I've got a lot to pack in. Shopping and sightseeing are the main priorities. 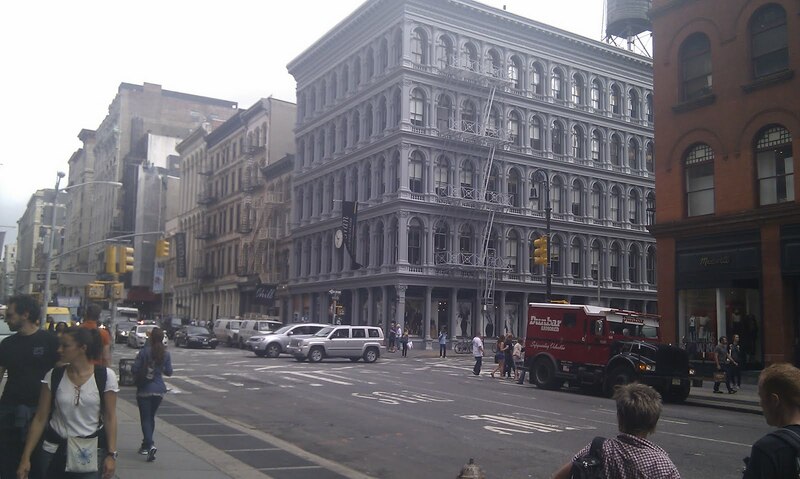 You can't come to New York without doing a bit of shopping. The city is one of the fashion capitals of the world. Shopping in many of the big flagship clothing stores in mid Manhattan can be a bit intense and full on. 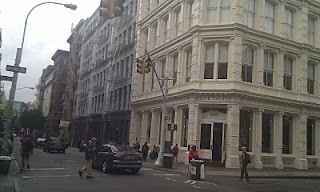 I found a great alternative checking out the shops in Lower Manhattan's SoHo district. 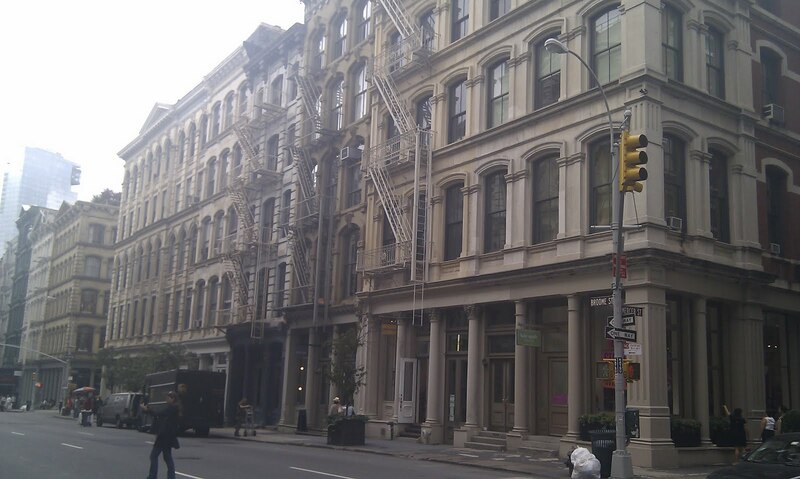 In SoHo you won't find huge skycrapers or iconic buildings that are instantly recognisable. What you get instead is a neighbourhood where it's all about the vibe. It's a very cool place to hang out. 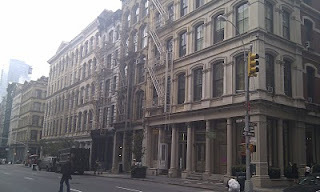 SoHo, was originally at the heart of New York's art scene back in the 1970's and 80's. It's still got that edgier artistic feel to it in contrast to the more commercial corporate world you find in Midtown Manhattan. I managed to pick up a great jacket from Banana Republic for $190. Now of course we do have Banana Republic in the UK (well London) but you can't guarantee they'll have the same things in the UK as over here. I love Banana Republic, it's now officially my favourite shop. 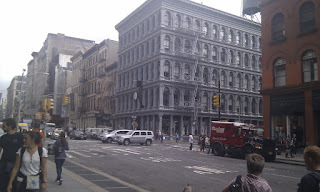 New York is a shopper's heaven. There's just so much on offer for people. New Yorkers are very lucky. I have to say, when it comes to Americans and their fashion sense, I'm not convinced. Generally speaking I don't think the average American dresses as well as people in the UK or the rest of Europe. However, New Yorkers are the exception. They're like Londoners, whereby any style seems to go. People aren't afraid to experiement or be different, which is something you don't always find with European fashion. 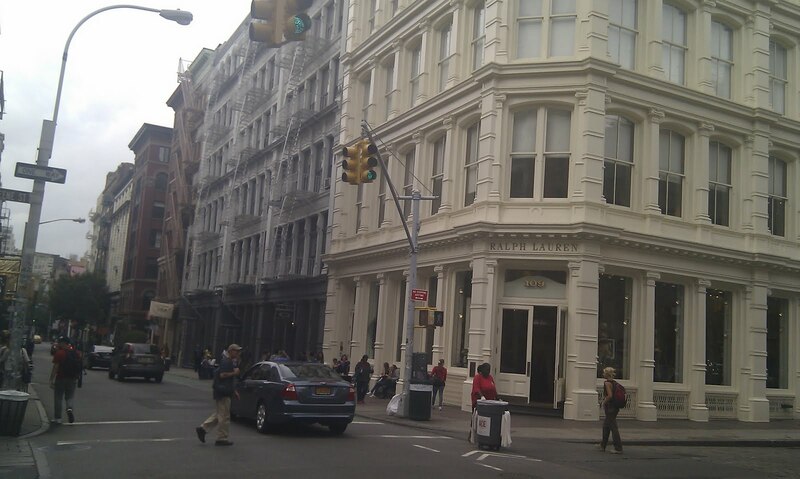 It was strange seeing familiar shops like Top Shop and H&M in SoHo. Nothing wrong with them - I shop there myself. But I suppose for Americans they represent the very best in affordable European fashion. 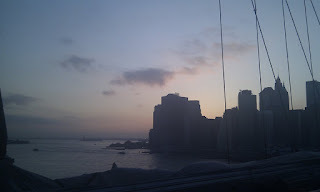 On this trip to New York I was determined to spend some time away from the island of Manhattan, and explore some of the outer boroughs of New York. 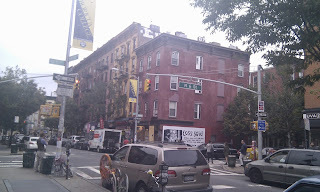 I decided to check out a place called Williamsburg in Brooklyn which I'd heard a lot about in recent years. It's one of those fashionable areas that's full of hip young urban professionals. The sort that work in the 'creative' industries or people who are writers and artists. 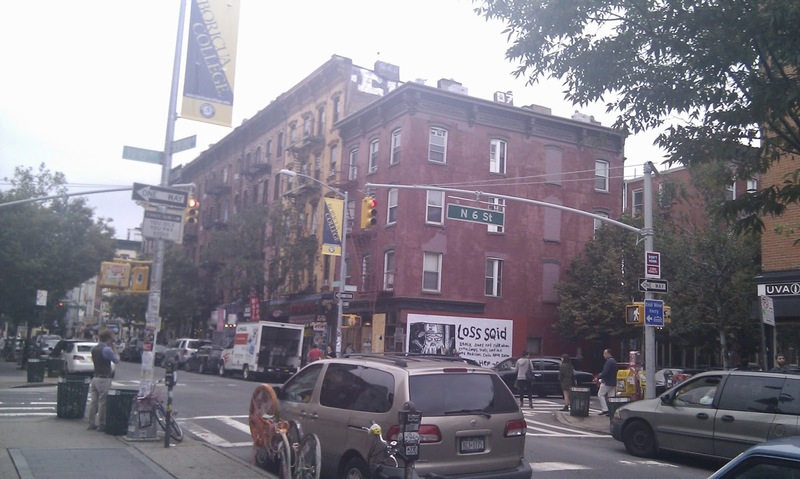 For those of you familiar with London, Williamsburg reminds me of places like Shoreditch and Stoke Newington. Everyone on the street looked achingly cool and trendy. 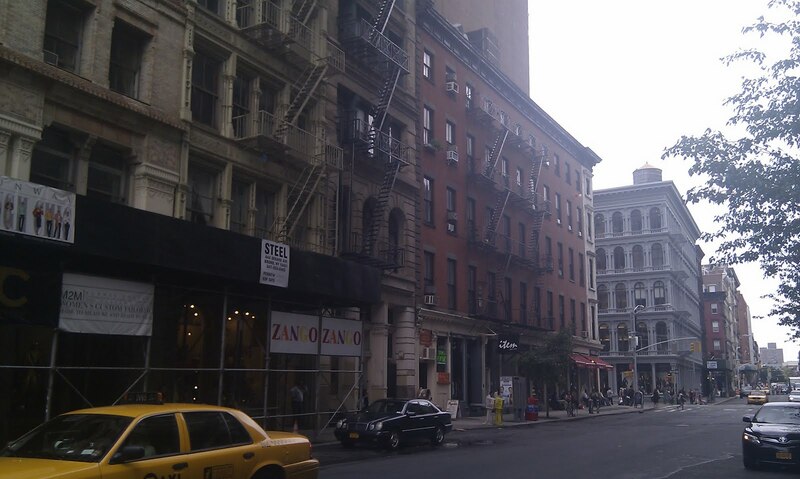 I enjoyed having a walk around the neighbourhood and escaping the hustle of bustle of Manhattan for a few hours. 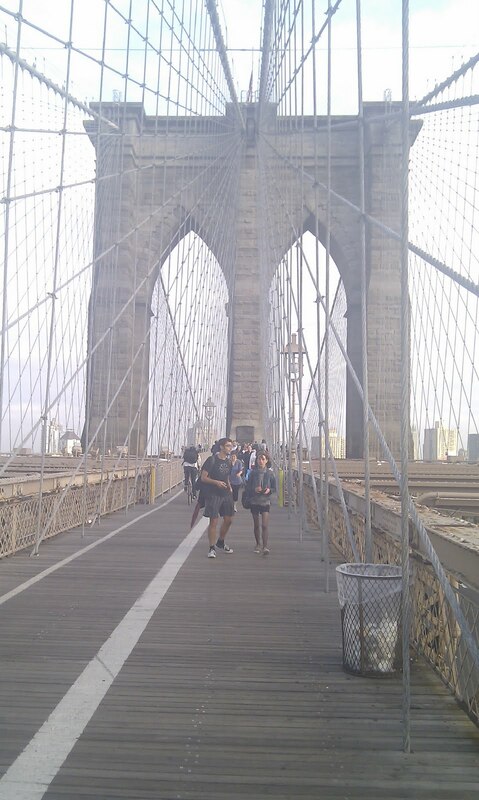 If you asked me one thing to do when visiting New York; something that costs absolutely nothing - I would say have a walk across the Brooklyn Bridge. 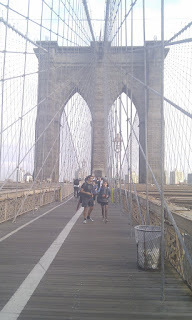 The Bridge links Lower Manhattan to downtown Brooklyn. As bridges go it's seriously impressive. When you think that it was completed towards the end of the 19th century it makes you realise what an incredible piece of engineering it is. 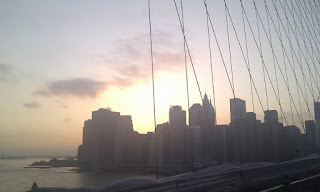 You can find some stunning views of lower Manhattan on the bridge, although you do need to avoid some of cycle lanes, as New York cyclers will let you know exactly what they think of you, should you get in their way! As I previously mentioned, walking the streets of Mid Manhattan can be intense. 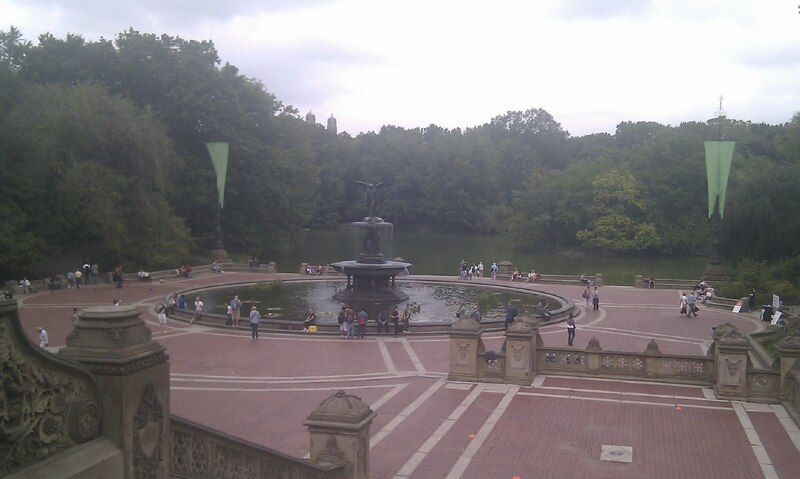 It's great to know that if you head far enough uptown, you'll eventually find the green oasis that is Central Park. One of the great features of the urban planning of New York has to be Central Park. I'm blogging live from New York this week. I'm spending a couple of days in one of my favourite cities in the whole world! I love New York. This is the first time I've been back since 1998. A lot's changed since then, most notably there's no Twin Towers, but there's still a lot of familiar sites. I arrived here mid afternoon New York time, and after settling into my hotel on 47th Street East, I soon hit the streets of Manhattan. 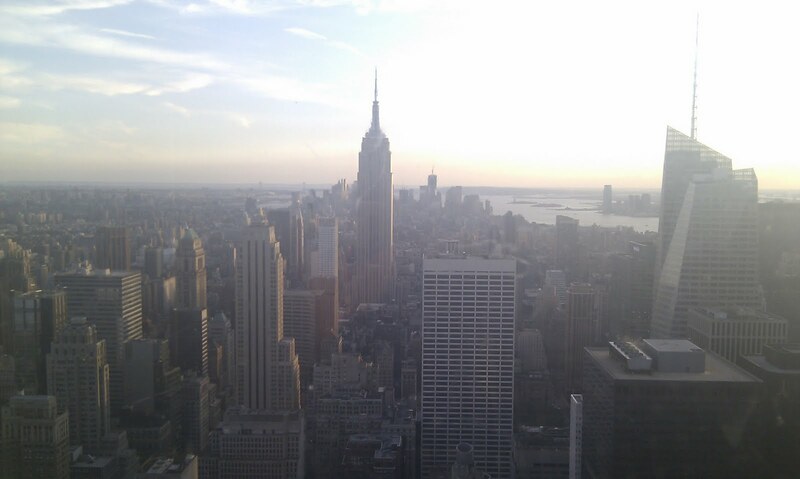 The picture above was taken from one of my favourite buildings in the city, the Rockefeller centre. I arrived at a good time, as the sun was just setting over the city. There's so much that I want to see and do in the next few days, so things are going to be pretty hectic until I leave on Thursday. Is this a golden age in men's tennis? At one o'clock last night I decided I really needed to go to bed, even though I was desperate to see the end of an amazing US Open final between Rafa Nadal and Novak Djokovic. For 3 hours I think I watched some of the best tennis that's ever been played on a tennis court. The standard in men's tennis at the moment is unbelievable. Last night's US Open final was another Grand Slam classic. Some of the rallies were truly breathtaking! It's not just the level of skill that was so impressive, it was the power and intensity of the rallies. It was brutal to watch! I do think we're currently in a golden age of men's tennis. Some of the Grand Slam finals I've watched in the last 5-6 years have been true epics, and last night was yet another one. It all started with Roger Federer dominating the game, then Nadal turned up proved unbeatable on clay before moving on to conquer every other surface. The two of them battled it out for a few years before the emergence of Novak Djokovic. Djokovic has always been good but this year he's been incredible, winning 3 out of the 4 Grand Slams titles this year. And lets not forget our own Andy Murray. I know he hasn't won a Grand Slam title yet, but that's only because of the 3 players already mentioned. He can still win a Slam but he just needs to find that extra something. The four of them together have helped to create a real golden period in men's tennis, I look forward to it continuing for the next few years. If there's been a bigger news story than 9/11 in my life time I certainly don't know what it is. Even now 10 years on, watching the footage of the Twin Towers collapsing still makes me think 'Did this really happen?' I'm still fascinated and shocked by the whole event. As part of the generation that grew up towards the end of the Cold War, I imagined the world would be a safer place after the fall of the Berlin Wall and the collapse of the Soviet Union. 9/11 made me realise this wasn't the case. You knew where you stood during the Cold War days. Suddenly there was a new danger out there, a new enemy which we knew little about and was totally different to anything we'd seen before. If you want to know where I was on 9/11 I was temping at the London School of Economics. Apart from remembering how boring the job was, 9/11 was the one thing that stood out from my time there. I imagined it might have been like this during the Second World War. That sense of danger, knowing that you were at war with an enemy that hated you and could attack at any time. Looking back it was scary stuff. A couple of days later I went into a book shop at the college and bought a book called The Islamic Threat - Myth or Reality? The book asked the question whether Islam and the West were on some sort of collision course and if so why. Clearly after 9/11 they'd already collided, but I wanted to understand why this had happened. I had this intense desire to try and make sense of it all. I wanted to understand why some Muslims in the world hated America and the West so much they were prepared to fly planes into skycrapers and kill thousands of innocent people. So on the tenth anniversary of 9/11 is the world a safer place? Has America and the West understood the causes of Islamic extremists? It's debatable. A few months after 9/11 US forces invaded Afghanistan to take on the Taliban. 10 years later they're still there and we still don't know what victory will look like or if it will ever happen. US and NATO Forces were meant to crush the Al Qaeda supporting Taliban regime and bring about democracy. The Taliban may not be in power but they're still part of Afghan society, whilst democracy is still struggling to survive. As for Iraq, this has been an even bigger disaster. Despite no evidence linking Saddam Hussien to 9/11 or Islamic terrorism. It still presented the perfect opportunity for 'regime change' for the likes of former US Defence Secretary Donald Rumsfeld and other Neo-Cons in the Bush Administration. It's all very well having 'regime change' but what about after the change of regime? What happens next? Not much thought was given to that. Earlier this year we saw the killing of Al Qaeda leader Osama Bin Laden who'd been in hiding in Pakistan. I suppose this brought some form of closure for many Americans, but Bin Laden's death was more a symbolic event. Al Qaeda aren't the danger they were, despite America telling us of their continued threat. If the truth be known, for most of us living in the West our lives are pretty peaceful. 9/11 was a spectacular one off - a one off that changed the course of history, but still something unimaginable. We have become more aware of extremist Muslim views around the world even in the UK, but much of their hatred and anger against the West has no real logic or objective. They're just anti the West because they hate the West. They have no political goals or objectives to offer ordinary Muslims. We've seen with the recent 'Arab Spring' uprisings in the Middle East that many Muslims aren't looking for radical Islam to change their lives, they want modern Western ideals and values like democracy, political freedom and prosperity. Extremism can't give them these things. Looking back, if 9/11 changed anything then it's changed the way the world sees America. We're seeing the decline of the world's only Super Power. In years to come we'll see 9/11 as very much part of America's decline as a major power. Never before had we seen the US attacked on its own soil. It reacted by starting two foreign wars with limited success, and which as a result only added to the huge financial and economic difficulties the country is currently experiencing. 9/11 showed that America could be vulnerable like anyone else, and despite it's economic and military power it's been unable to truly defeat the causes of those terrorist attacks. As always I loved watching last week's World Athletics Championships in Daegu, South Korea. This was our best performance since 1993 and we managed to reach our target of 7 medals with two golds, but for British athletics it's all about the build up to 2012. Head coach Charles van Commenee has set a target of 8 track and field medals. He's a hard task master and sets very high standards (I wouldn't want to upset him) but I think he's being realistic. I think the the best case scenario is that we win 2 to 3 gold medals, but there are no gold medal guarantees. There's been a lot a criticism in some quarters for Britain's performance in Daegu, some of it's been deserved, but people need to realise just how tough and competitive world athletics really is. Has to be Mo Farah. In the last week, along with last summer's European Championships, he's proven that he's the best long distance runner this country has arguably ever produced. He was unlucky in the 10,000m you can argue that he went out to early with 500m to go, but he took the gamble and it almost paid off. Despite the disappointment of coming second he showed a huge amount of character to come back and claim the the 5000m title. I'm really pleased for Mo. I've been reading a few interviews with him in recent weeks, and he's made a huge amount of sacrifices to achieve his success. He's gone to Kenya to train with some of the top Kenyan distance runners. Trained at altitude in the Pyrenees and moved to America to continue his training. What's great is that he's proved that by making sacrifices and embracing tougher training methods, Europeans can compete and beat the very best East African athletes. I have to admit I'd never heard of Hannah England until the final of the women's 1500m, but what a great performance. She got her tactics spot on and timed her finish to perfection. I also discovered that she's trained by one of my former school teachers, a Mr Bud Baldero. Well done Bud! England's announced herself on the World Stage but she needs to kick on. There's no guarantee that she'll repeat this performance next year in London. It's important that this isn't a one off and that getting to next year's Olympic final is the minimum that she should achieve. For me the biggest disappointment of the last week is that there's no young sprinters coming through and reaching finals. Taking nothing away from the likes of Marlon Devonish and Christian Malcom, we should have a new generation coming through and replacing them. Our best 100m runner is still Dwayne Chambers and he can't compete at next year's Olympics due to his previous drugs ban. Mark Lewis Francis - I just give up on these days and Harry Aikines-Aryeetey is far too bulky and needs to lose some of that muscle weight. Things aren't much better moving up to 200 and 400m. It's probably asking too much to expect any medals next year but we should be getting people into these finals. The golden girl of UK athletics Jessica Ennis could only achieve a silver mainly as as result of a terrible javelin. I don't think this is a disaster. As I said before world athletics is incredibly tough and it's not easy to win gold medals. There was a danger that the British public would assume that Ennis would only need to turn up to win gold and that's not going to be the case. The winner of the heptathlon Tatyana Chernova won with a score of 6,880. That's 49 points beyond the British record held by Denise Lewis. Ennis's personal best is another 8 points back. It just goes to show, that she will need to raise her game for next year to have a chance of winning gold. I still have a lot of confidence in her and she still remains one of our best gold medal hopes. I really thought Phillips Idowu was going to retain his world title when he jumped a season's best of 17.77m. It was just unfortunate that the winning jump by American Christian Taylor's was the 5th longest in history at 17.96m. What can you do about that? You can tell that Phillips has really emerged as a big time competitor and although it would have been great for him to win, getting a silver is still a good result. He'll be in the mix next year in London I have no doubt. Dai Green and Andy Turner. Didn't expect a gold medal from Dai Green in the 400m hurdles, and Turner was able to claim a bronze following the disqualification of Dayron Robles; but their success made me think back to last year's European Championships. Both Green and Turner won golds last year, but you still had people saying the standard at the European Championships wasn't that great. That may be the case, but winning at that level instills a winning mentality and breeds confidence. I think we've seen this with both these hurdlers. They'll be in the medal shake up in London. Admittedly this has nothing to do with Britain, but I wanted to mention Usain Bolt, purely because he's the greatest ambassador the sport of athletics currently has. Secondly a word on the tiny Caribbean island of St Kitts and Nevis. This is the island where my mom's family originate from. Not only did the 35 year old Kim Collins win a bronze in the 100m; St Kitts also managed to take bronze in the 4x100m. Not bad for an island with a population of roughly 45,000 people!